What design criteria support rich argumentation tasks? *Extension - Analyze an argumentation task within a lesson! (If participants completed the Introductory Module) During the Introductory Module we covered four elements of argumentation that students may require extra support with. Which of these elements did you see in the video? Where did you see them? What criteria do you think the teacher had in mind when designing this rich argumentation task? What different criteria do you consider when designing tasks that engage students in argumentation? You will now have an opportunity to evaluate two lessons that include argumentation tasks. 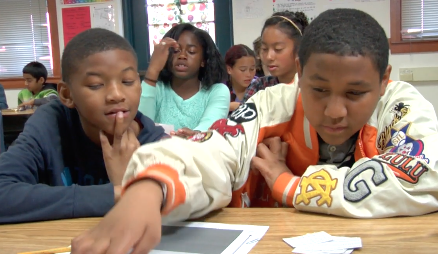 As you read each lesson, keep in mind the design criteria for rich argumentation tasks. Analyze the two lessons with respect to the four design criteria previously discussed. Either individually, or in pairs, redesign the argumentation task in Lesson #1 or Lesson #2 from the previous activity in terms of one of the key design criteria. This redesign might include restructuring the task completely and/or changing the data that students are using. Who would like to share their revisions? Make sure to articulate how these revisions attend to the criteria you selected. Pick a lesson from existing curriculum that includes an argumentation task and analyze it with respect to the four key criteria previously discussed (similar to how you did during the Lesson Redesign Activity). 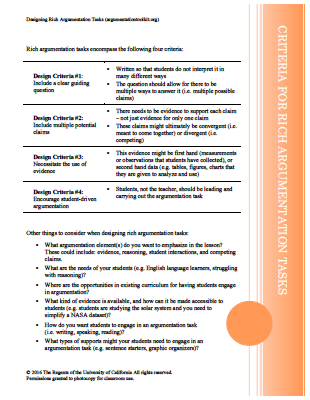 You might find it helpful to use the Criteria for Rich Argumentation Tasks handout. For the next meeting, bring the lesson you analyzed, along with notes of this evaluation.